UPDATE 12/5/13: This offer has been extended to expire December 31, 2013. Metcal's new MX-5210 MX-5200 Series Dual-Port Soldering & Rework Station is an exciting piece of technology created to allow two handpieces to work from one power supply simultaneously. Even more exciting is Metcal's current special offer: When you buy an MX-5210, you'll get three FREE cartridges. Running through December 31, 2013, this special promotion offers three Metcal STTC-136 Soldering Chisel Cartridges (suitable for most standard applications such as through-hole and SMD rework) for each Metcal MX-5210 Soldering and Rework System purchased. All you have to do is purchase one or more MX-5210 units and Q Source will take care of the rest. 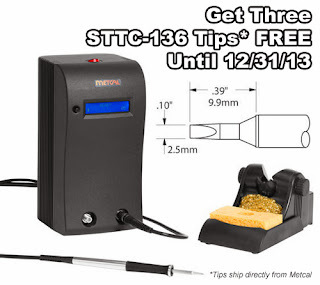 Metcal will send you your three FREE cartridges directly. The MX-5210's dual simultaneous ports allow two operators (two handpieces) to work at the same time while sharing the unit's 80-watt output power. A single operator can also take advantage of this feature when different handpieces/cartridges are required for various applications. The ESD-safe MX-5210 provides enough power for challenging tasks like working with high-mass components or multi-layered boards. The Metcal MX-5210 Soldering and Rework System includes one advanced MX-H1-AV lightweight, ergonomic handpiece compatible with all STTC and SMTC Metcal cartridges, and one TipSaver MX-W1AV auto-sleep workstand. The MX-5210 System ships with everything needed for effective soldering and rework applications such as lead-free, thermally sensitive components, high-volume production soldering, touch-up soldering, and conduction rework of SMDs when used with the SMTC Series Cartridges. For more information about, or to place your order for the Metcal MX-5210 Dual Port Soldering & Rework Station please visit QSource.com. You can also give us a call at 800-966-6020 or contact us via email. Metcal's special offer expires December 31, 2013 and cannot be combined with other offers. After your MX-5210 order has been processed we will provide Metcal with the appropriate information and they will send you the three FREE cartridges. If there's a product or topic you'd like to see The Q Source Resource write about please let us know. We'd also appreciate if you share this blog post with your friends and colleagues via the social media links below. If you have questions or comments about Metcal products or related topics please leave us a message in the comments section.